This mailer is portrayed as an “informational” communication because it does not expressly advocate a position on the ballot measure. (See it here: Monterey Peninsula Regional Park District Mailer to Local Voters – July 2016.) Of course, a campaign consultant can design a communications strategy to influence voters without explicitly telling them how to vote. The Monterey Peninsula Taxpayers Association has identified and compiled substantial evidence to show that the Monterey Peninsula Regional Park District has improperly used public funds to influence registered voters to vote YES for its proposed Special Tax. Most people would recognize the pictures, text, and graphic design of the mailer as a message to support the Special Tax. Mailer content seems to have been carefully developed to avoid outright telling voters to Vote YES while reassuring voters that the Park District would spend their tax money appropriately if they happened to Vote YES. For example, the mailer tells registered voters that the Park District’s Oversight Committee since 2004 has given a “stamp of approval” to how the Park District uses certain tax proceeds. This is not technically or legally what that Oversight Committee does. More revealing about the motivation for the mailer are emails among Park District board members, Park District staff, and contracted professional campaign firm TBWB Strategies (with its affiliate TBW Media) about mailer development and design. Emails cited below show that the publicly-funded mailer was meant to influence registered voters to support the Park District’s Special Tax on the November 8, 2016 ballot. Exhibit A May 31 A Park District management employee asks TBW Media employees for a conference call for “timing and information needed for the mailer going out after June 7 primaries” It was strategically critical for voters to receive the so-called “informational” mailer after the June election (when the Special Tax was not on the ballot) and before the November election (when the Special Tax is on the ballot). Exhibit B June 9 A TBWB employee provides a Park District management employee “with the timeline that I was thinking for the mailer” that indicates a “Piece mails to all registered voters” on July 5. The choice to send the Special Tax mailer to all registered voters in the Park District contrasts with the practice of the Park District to mail its genuine informational communications to all RESIDENTIAL CUSTOMERS, including those who are not registered voters. Each year, the Monterey Peninsula Regional Park District produces and distributes what it calls an “award-winning” catalog of programs called “Let’s Go Outdoors” to residents, presumably because the Park District serves ALL residents, not just those who are registered to vote. I’m a bit unsure of how to incorporate the Maritime Chaparral or Oaks Woodland information. Given the reach of this piece (all registered voters) I want to make sure we are painting broad strokes and not getting too far down in the the (sic) weeds of specific projects or parks. There are countless great projects, parks and initiatives that you guys can highlight, but given the limited real estate of this piece, I want to make sure we keep the message high level. In terms of drawing more attention to the fiscal accountability points, we need to be careful. If we are obviously highlighting them, one could argue that we are advocating for the measure by over emphasizing what a great investment it is. Given this is a publicly-funded communication, we must stay 100% informational and thus I think it is important that we provide the fact that there are indeed fiscal accountability requirements in place but don’t tout them. Exhibit H June 27 A Park District management employee provides a TBWB employee with comments from a Park District board member, including “The documents needs (sic) to be offered in Spanish.” The email does not explain why a Spanish version of this mailer to registered voters is needed, but legitimate informational communications from the Park District (including the annual Let’s Go Outdoors program guide) had not been provided in Spanish or other languages. Exhibit I June 28 A TBWB employee expresses his skepticism to a Park District management employee about the return on investment for a Spanish language version of the mailer: “Do you have an in-house translator? What we could do is design a Spanish version and post it on your website but not mail it. The mailed English version could have a footer that reads (in Spanish) ‘For more information in Spanish visit www.MPRPD.org”. The cost of printing and mailing Spanish versions of the flyer is really not worth the return.” The email does not explain what “return” is being evaluated. Exhibit J July 1 A Park District board member asks for analysis from a Park District management employee: “…I think this flyer should be in Spanish as well. I wonder, have we ever gone to the effort to translate our public-facing documents? Is it worth it? I do not have statistics on how many people in our district speak Spanish, so perhaps this is not a very impactful thing to do, but my hunch is that it is. What are your thoughts on this?” The email does not explain what “impactful” means. Was this legal? The State of California has not established a competitive bidding threshold amount for the professional service contracts of Recreation and Parks Districts, and until the February 17, 2016 Park District board meeting, the Park District apparently did not have a formal Professional Consultant Selection and Purchasing Policy. At that meeting, the board unanimously adopted a selection procedure for professional services in excess of $25,000 that includes an RFQ/RFP or an RFP and review and ranking of the proposals under specific criteria. To support its recommendation of TBWB Strategies, the January 5, 2016 staff report listed successful bond measure and tax measure campaigns managed by TBWB Strategies on behalf of Monterey County governments and park districts in Northern California. It also noted that “TBWB’s parent firm is the campaign consultant for Senator Bill Monning, Assemblymember Mark Stone and County Supervisor Jane Parker.” Park District jurisdiction falls within the districts of these three elected officials. The staff report did NOT indicate if TBWB Strategies had ever performed campaign consulting services for board members of the Monterey Peninsula Regional Park District. The board also authorized the General Manager to amend the term of the contract to add an additional nine (9) months, through the end of calendar year 2016, if the survey results indicated a 2017 or 2018 ballot measure “is advised.” In February 2016, the Phase II contract was subsequently extended through August 31, 2016.
WHO PAID FOR PRINTING AND POSTAGE FOR THE MAIL PIECES? 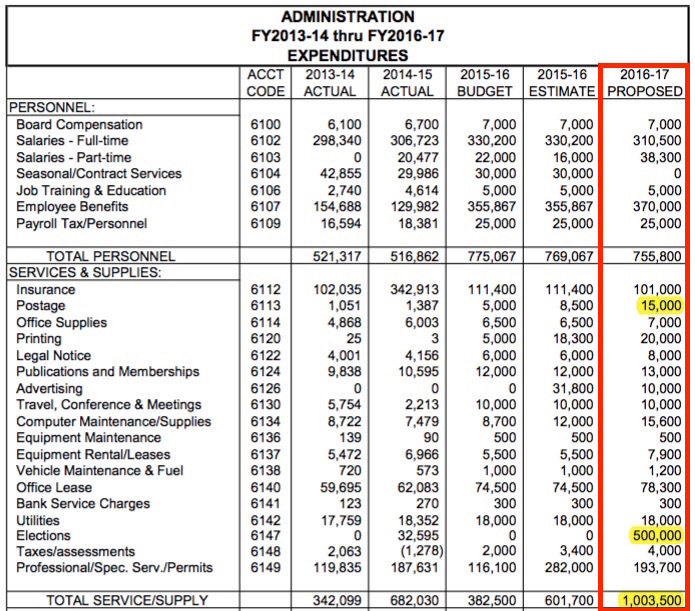 The Park District budget itself indicates “a $418,481 increase (8.4 percent) above FY2015-16 year-end budget estimate of $4,968,224 and $413,205 more than estimated revenues. The increase is attributed to expenditures for the potential Board seat(s) and community facilities district elections. Staff proposes to cover these excess expenses by using funds from the District’s reserves.” It is not said if the Park District will restore the reserve fund with Special Tax proceeds if voters approve the Special Tax or how the Park District will restore the reserve fund if voters reject the Special Tax. Also mentioned in the budget, “The proposed FY2016-17 Administration budget of $1,759,405 is an increase of $388,533 over the FY2015-16 year-end budgeted amount of $1,370,872, primarily attributed to the required funding for potential elections for two Director seats and the community facilities district.” See the chart below. At some point, the Park District has to reimburse TBWB Strategies for the expense of postage for the mailer. Postage was directly paid to the US Postal Service by TBW Media, as shown by the pre-sorted standard indicia on the mailer. © 2019 Monterey Peninsula Taxpayers Association | Protecting the interests of taxpayers on the Monterey Peninsula.